Cut list runs are extremely short (less than 12 pieces) between angle set-ups or multiple angle cuts on same workpiece. Cutting 2x6 material on edge for rake wall manufacturing. Removal of possible operator error when adjusting for angle settings. Easiest and quickest possible method of machine adjustment. 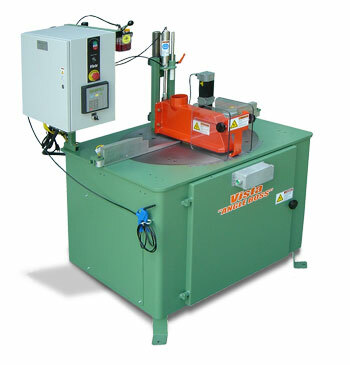 M-20 Auto-Set machines miter cut up to 75 degrees from 0 (90 degree cut). Cut length on 1-1/2" thick material with fence at standard position (single point of cut) - 12 inches. Typical cuts are: 90 deg. on 2x12s - 30 deg. on 2x10s - 45 deg. on 2x8s - 60 deg. on 2x6s - 70 deg. on 2x4s. M-20 Auto-Set machines are capable of cutting 2x6s on edge for bevel cuts. 4x4s cut with ease. Fence rails on machines are positioned centerline of table. This keeps the cut at the fence line in same position regardless of angle setting. Single Angle Mode - the angle adjustment setting is entered into the operator interface keypad. When the "Enter" key is depressed, the table rotates to position. Machine is now ready to cut. Operator pushes either left or right button located on front door control box. This brings the clamp/guard assembly down onto work piece. While holding this button, operator pushes second button. This cycles the blade up & down to make the cut. This method of operation ensures the operator cannot have a hand or finger in the cutting area of the machine. Releasing either button at any time lowers the blade below the table and then raises the clamp/guard assembly. Multi Angle Mode - the operator can input up to 12 different angle settings into the controller. After each cut cycle is completed, the table will automatically rotate to the next programmed angle setting. Air Over Oil control of saw cutting speed ( for non-ferrous metals).